A short walk visiting the wooded valley of Fell Beck before returning to Brimham Rocks to explore one of the finest gritstone playgrounds in the world. After enjoying a lot of good walks in September I fancied doing something a little bit shorter and closer to home. It had also been a while since I’d got my daughter out for a walk so I came up with this route. Brimham Rocks is, despite the crowds, one of my favourite places. This route provided plenty of opportunity to explore the rocks at the the start and end to the walk with a contrastingly quiet section in the middle. Everytime I go the car parking charges seem to get more expensive. Having parted with £7 of change we crossed the left hand car park to take a thin path dropping down through some rocks. Within minutes we came to a superb spot with crags to our right and a huge square monolith of gritstone to our left. This I found out from one of the two climbers who were just about to go up it is known as the Cubic Block. 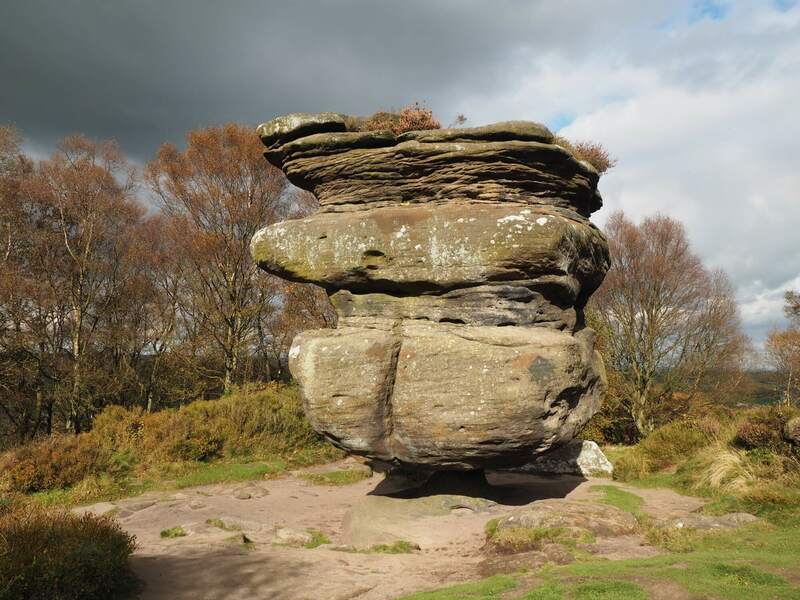 I’ve been to Brimham Rocks many times but can’t remember seeing it before. It was certainly impressive. Beyond the Cubic Block we dropped down to a broad track. Briefly turning right we then passed through a gate to walk towards High Wood Farm. Before reaching the farm a muddy path on the left led us into High Wood. This was a lovely section of woodland featuring scattered outcrops of mossy gritstone. Passing through an open pasture we joined the Nidderdale Way on its downhill course towards Smelthouses. Occasional openings in the trees provided nice views of Nidderdale. Also noticeable were the large numbers of acorns scattered on the ground from the oak trees lining the path. After a pleasant descent we reached some cottages. Turning left we soon reached a back road, turning downhill on this we arrived in the quiet hamlet of Smelthouses. For such a small place Smelthouses certainly has its fair share of impressive houses. Crossing over the bridge we walked uphill a short distance to take a path signposted to the right. Inititally passing below a tall stone wall on one side and a hedge on the other the path eventually passed into the attractive woodland of Fell Beck. The following section, following the path upstream, was one that I’d enjoyed on the first day of the Nidderdale Way, earlier in the year. I thought that it would look even nicer in the autumn and I wasn’t wrong. Eventually we reached a footbridge. Crossing over this the path turned right before doubling back to the left well above the stream. Arriving at a crossroad of paths we turned right to exit the woods and walk up past Low Wood Farm with its geese, chickens and guinea fowl. At the top we turned left at a junction heading back in to the woods. The path was not particularly clear at this point. With the help of my OS app we stayed on course to reach a grassy track and an open gate on our right. Passing through the gate we climbed up a couple of sheep pastures to reach a wide track just above Brimham Rocks Farm. Turning left on this track for a few minutes we then took a fainter path doubling back up to the right. Initially passing below some rocks this path soon led us to the area of Brimham Rocks featuring two of its finest formations, The Idol and the Druid’s Writing Desk. After enjoying the views from the Druid’s Writing Desk, and a brief spell of sunshine, we made a beeline for the trig point. This sits just behind the National Trust Centre and close to the kiosk where we treated ourselves to an ice cream. After ice cream it was time to do a bit of exploring before returning to the car. This included a bit of scrambling with Rhanny on the rocky bastions of Druid’s Castle Rocks and a visit to the Surprise View. For anyone wanting to do a bit more than just wander from the car park to the main rocks this walk is a good option.